The Bookshelves: Interview with Kimberly Sabatini! 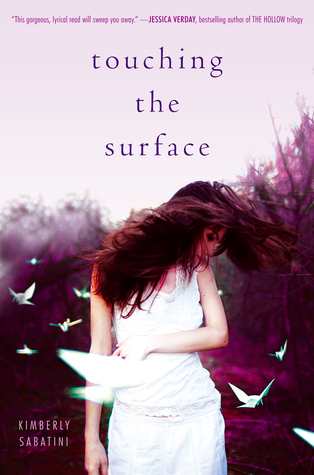 Patrick-What inspired you to write Touching the Surface? Kimberly-About seven and a half years ago my dad died. I really needed an outlet for my emotions, but even more importantly, I wanted to honor him by being a stronger, healthier person. Standing up and having a voice was something we both struggled with so I decided to rise to my own occasion. Additionally, I felt as if my dad passed on, leaving some unfinished business in his planner. Oh, who am I kidding--neither one of us was organized enough for a planner. LOL! Anyway, it didn't seem right to me that I was going to be working so hard to challenge myself and he'd just move on, especially since we both still had a lot of the same weaknesses to over come. Was dying a kind of pass go and collect $200? That didn't resonate with me. I started to try and figure out what made sense and I tried to imagine where it was that I felt comfortable picturing him. That is how the Obmil was born. I'm not a brand person. I gravitate towards what works for me. It could be something high end or it could come from the $2 bin in Walmart--it just needs to make me feel good when I wear it. Kim-My favorite YA read in 2012 so far is THE FAULT IN OUR STARS by John Green. I was moved and forever changed for having read it and I can't ask for more than that from a book and an author. I aspire to leave that much honesty and heart in what I write. Patrick-What were the hardest and easiest part of writing Touching the Surface? Patrick-How did you come up with the title? Kim- Titles are EXTREMELY important to me. I don't think I could write a book without first having the title. It's the thread with which I weave the deeper meaning of the story--it ties it all together. I don't want to give away any spoilers so I'll just say that TOUCHING THE SURFACE is layered throughout the story in many different ways--or at least that was my intention. Hopefully the readers will find that to be true. Patrick-Tell Me in Twitter Style [140 words or less] about Touching The Surface! Patrick-Do you have a playlist for Touching The Surface while writing it? Kim-Absolutely!!! One song even made it into the book LITTLE BIRD by Annie Lenox. Patrick-If you had the chance to be immortal who you take it? Why or Why not? Kim-I kind of already think that there is a part of us that is immortal. In my humble opinion, we can not even comprehend the magnitude and complexity of the place where our soul lives. And I find this oddly comforting. M-YA or Adult, what you read. Patrick, thank you so much for having me over to your blog. It was so much fun and I really hope that you make a connection with TOUCHING THE SURFACE.